Jayson Blakley led a tour of restaurant, hotel, sports club, and wine bar owners at Jordan Vineyard & Winery last month, and let Marla Schulman and myself join in as media papparazzi. 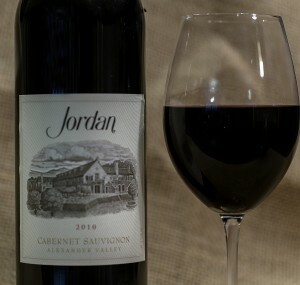 The final tasting and food pairing of the tour demonstrated the range of the Jordan Cabernet Sauvignon 2006 to this very knowledgeable group of tradespeople. They were very much in agreement with the elegance and versatility in this wine which they already knew quite well. The dark crimson triangle is Membrillo, perhaps the best of the surprises in this matchup.